This selection of wading birds is known for their long legs and specialized bills, predominantly long and designed to dig into the muck to find their prey. More gregarious than many of the herons, they can often be seen in large flocks. 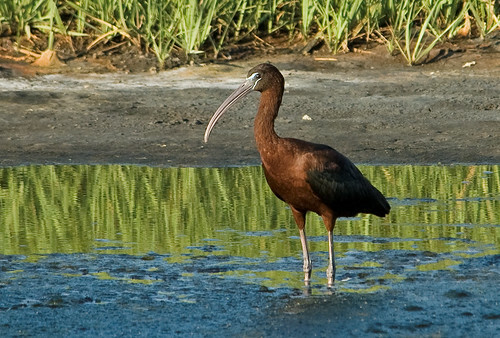 Ibis tend to be found in the southern part of the country, although the White-faced Ibis spans almost the entirety of the western half of the continent. The Glossy Ibis the most common species seen along the entire east coast, and I’ve been lucky enough to see them in NJ, NC and Florida. Beautiful, purplish colors predominate, but greens and iridescent hues can be seen in the sun for a beautiful effect. 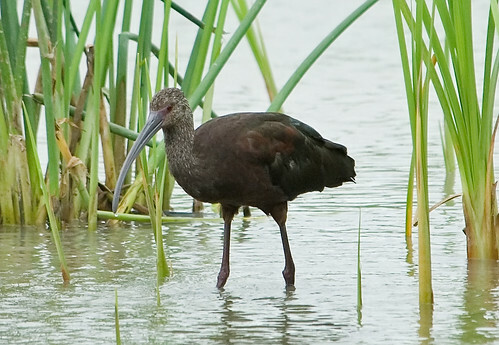 White-faced Ibis are a western species but we got to see a number of them in the ponds of Estero Llano Grande. 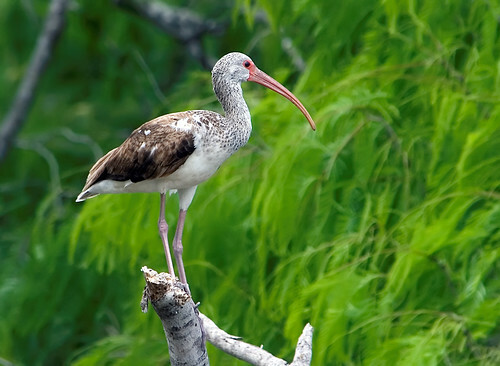 I’ve only seen mature White Ibis down in Florida, and at a distance. But I had a great chance to see a first-year bird at Estero Llano Grande in Texas. 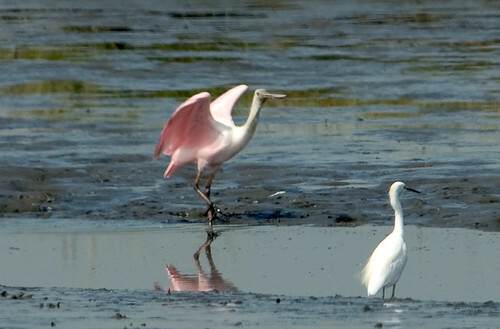 Roseate Spoonbills are a unique species with a very specialized bill. Their pink color is highly noticeable as they sweep their bills to filter for small prey in the swamps. Strangely, I’ve seen this species twice and neither time was in their home state of Florida. Instead, Forsythe NWR hosted one of these birds two years running. Most people think of storks as either a creature bringing children to expectant mothers or as a symbol or ancient Egypt (although the former are actually based on the European white stork (Ciconia ciconia). American storks are quite a bit less ‘pretty’ than their European cousins. 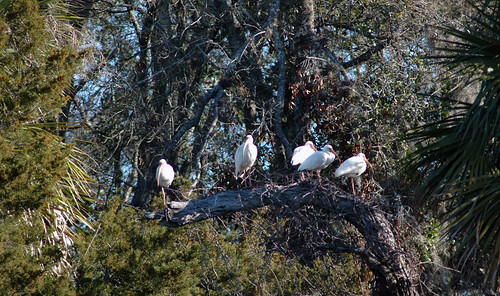 The Wood Stork is bright white with a dark faces and large, dark, down-curved bills and black wing-tips. I’ve seen them in the Everglades buthave no pictures of them. The Jabiru is a large, South American stork species with a dark head and massive bill which is only rarely seen in the U.S. (usually in Texas). With that rarity, it’s not unexpected that I haven’t seen one. The American Flamingo is a species that is sometimes depicted as an American bird (I always think of the opening sequence for “Miami Vice”) but in reality they aren’t found in the U.S. Most flamingos found in the U.S. are in fact escapees of the American species (Phoenicopterus ruber) from the Caribbean or species from Africa or South America. Only very occasionally are wild specimens of P. ruber seen in the U.S. So, I’ve seen flamingos in Florida, but at this point I’m not sure which species they were. I’d have to count on a second sighting (or see them in the Caribbean) to actually add this species to my lifelist. Most of my chances to see the least bittern have also been at Forsythe NWR, although the aforementioned ‘hidden-in-plain-site’ bird was seen at John Heinz NWR. Frustratingly, even though it was so close I was unable to get any pictures so it represents one of the only 2 birds of this group I don’t have a photo record of.